On a still road in Penestanan Village in Bali's central foothills, a dull, blue-stained signboard points toward the house of the medicine man. Ketut Liyer is a ninth generation healer of undecided age  "maybe 90?" he shrugs  who has never been off the Indonesian island. But the dozen or so women who crowd his compound this afternoon, their chatter in competition with the peeping of caged birds suspended from clay-roofed pavilions, have come from all over. One by one they approach the small, weathered Balinese seer with the brilliant, near-toothless smile, and have him interpret their palms, their legs, sometimes even their spines. At the outset of the book, which has now sold over seven million copies worldwide, the medicine man predicts that Gilbert  newly divorced, disconsolate and on assignment in Indonesia  will return to Bali and teach him English. In what follows, she escapes suburban New York and over one year indulges the senses (and above all the stomach) in Italy; quiets the mind at a West Indian ashram; and, revisiting Bali, finds new love in a Brazilian jewelry exporter. If 170-odd weeks on the New York Times Best Seller List is anything to go on, weary Americans can identify with the need to regroup on unfamiliar ground. Now, in advance of the August U.S. release of a film adaptation starring Julia Roberts, that need has given rise to a new customer for Balinese hotels, travel agencies and tour operators: the spiritual seeker. Newly launched packages by luxury resorts and spas like Ubud Hanging Gardens and the cliff-top Ayana promise to recreate Gilbert's four transformative months on Bali in a few passing days with yoga classes, drawn-out beach dinners, massage therapy. As of June, the upscale chain COMO Hotels and Resorts combines Bangkok, Bhutan and Bali in an Eat, Pray, Love excursion that culminates at the swish Uma Ubud, where guests can choose from cleansing temple rituals, sessions with Ketut or outings to locations where the movie was shot. [Update: COMO has cancelled its Eat, Pray, Love excursion.] Other tours built around the book focus on curative group gatherings and self-discovery of the kind Gilbert has down. "Not even Italy or India could give her the peace she longed for," boasts Indonesia's official tourism website. "And she found it in Bali, island of gods and goddesses." The idea behind these offerings is not to knock off a checklist of the people and places the writer visited, but to partake  however briefly  in her progress. "It really did feel like Liz was helping us experience some of the same spiritual growth she did," says Halle Eavelyn, co-founder of Las Vegas-based Spirit Quest Tours, which led its first six-day Eat, Pray, Love Bali trip at the end of May. Eavelyn, who testifies to turning overnight from atheist to believer, offers, with her husband, "life-changing luxury travel." The island, she says, is "where the culmination of Liz's flowering happened, so we skipped right to the end of the book." Of the 15 participants in May's tour  aged 29 to 78, and all but two of them women  most describe undergoing "shifts." One lady finally began to confront her husband's death. Another, an insomniac, slept soundly for the first time in over a decade. Mornings, the group would share in meditation sessions, learn from local guides to pray in full sarong, jot thoughts in journals; an evening might be spent bathing with hundreds of pilgrims in the holy springs that feed a stone temple pool; at lunch, authentic pizza with the America-sick Balinese musician who once road-tripped with Gilbert across the entire island. And on either side of their activities Eavelyn read caringly selected passages from the book, "an awakening tool," off a brand new iPad. The tour costs $3,000 with airfare, but spotlights a site that doesn't even require getting off the ground. Says Eavelyn: "I want to take people to a place inside themselves." Another therapeutic retreat led by Sterling Nelson, an impossibly enthusiastic Jungian psychotherapist and entrepreneur who first visited the island as part of a "post-divorce celebration" 10 years ago, sets out in September. Nelson's vision is of an intimate group of women, "women like myself who might need transformation and will enjoy doing it in the company of other Yayas." So far, inquiries have largely come from Californians whom she hopes will enjoy Bali's distinctively numinous energy. "You can go to Florida if you want to sit around and drink Margaritas," she says. 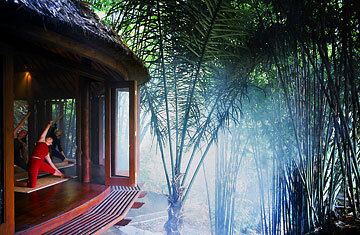 Indeed, Bali has a deep-seated and singular spirituality. A lonely Hindu enclave in the predominantly Muslim Indonesian archipelago of 17,500 islands, its unique variant of faith is a composite of Indian cosmology, Tantric Buddhism, local animist traditions and ancestor worship. Rock-cut temples are tucked into verdantly layered rice terraces; divine images that line the sand are periodically anointed with thick colored powder; little hand-woven baskets filled with fruit, petals and rice grain offerings are scattered in the streets, to the delight of stray dogs. But before terrorist bombs rocked its southern coast on an overcrowded Saturday night in 2002, killing over 200, most young Australians, short-term tourists tended to view the island as one big beach bash. The blasts cleared the holiday-makers out; "I am very empty in my bank since the bomb," Ketut Liyer regularly gripes in Gilbert's book. Ketut's bank account is not empty anymore. The medicine man charges $25 for a palm-reading, not far off from what the average Balinese makes in a week. Wayan, an outspoken Indonesian healer of dark beauty and another of Eat, Pray, Love's personalities, was, with her young daughter and two adopted orphans, once on the verge of eviction. Now a staff of well-built men churns out her healthful Vitamin Lunches for calling travelers. From January to March of 2006, 237,260 foreign tourists stopped by Bali. Since then the number has swelled steadily, and in the same three months of this year, there were 551,186 visitors to the island. While precise figures are not yet available, industry observers from the Denpasar Tourism Academy have confirmed that the island has been repopulated by tourists looking to develop their spirituality. Upwards of 20 hotels in the forested cultural center of Ubud have responded to a call by Minister of Culture and Tourism Jero Wacik to train staff in yoga and meditative practice. "It's a thing we want to promote because those activities bring peace to mind," says Nyoman Suwidjana, deputy chairman of the Bali Tourism Board. "And Bali loves peace." The promise of serenity is what drew Denise Nieman, a self-described "tired-of-it-all lawyer." A member of the Spirit Quest Tours Eat, Pray, Love trip, she made the tense and unfamiliar decision to leave her mobile phone and e-mail account behind for that one week in May. The Balinese, she says, taught her to worship life, guiding her toward the type of balance that is "ingrained in their tradition." Bali's philosophy of Tri Hita Karana posits that there are three relationships that human beings need harmonize if they are to find tranquility: between man and God, man and man, man and nature. The concept pervades a place like Tanah Lot, Nieman's favorite site, where tonight at high tide devotees help each other cross the salty water, hand over hand, to reach the Hindu shrine on a gnarled offshore rock. It is no wonder that Elizabeth Gilbert came to the island at the end of her passage, searching not for romance  though she found that, too  but for equilibrium between worldly pleasure and devotion. It is the thing most sought after by the voyagers, themselves not often broken souls or desolately single middle-aged women, who take her same path. It is the thing that Nieman has held onto and tried to bring back home. "It's a great way to live," she says, "making everything a ceremony, everyday."